Download "Credit Card Advantage 7.0 User Guide"
9 CREDIT CARD ADVANTAGE 7.0 USER GUIDE 9 ACH payment. Reference Credits Non-Referenced Credits A credit transaction that is issued with information from a previous transaction. To do this transaction would need a Transaction ID. A credit transaction that is issued without any previous transaction. To do this transactions would not need a Transaction ID. 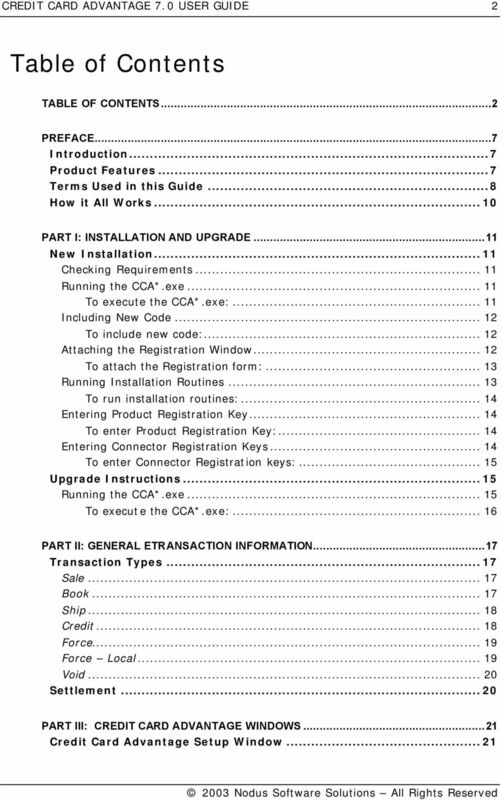 11 CREDIT CARD ADVANTAGE 7.0 USER GUIDE 11 PART I: Installation and Upgrade New Installation There are several steps to installing CREDIT CARD ADVANTAGE. Each section below covers one of the steps detailed below. Checking Requirements Obtaining the CCA*.exe Running the CCA*.exe Including New Code Attaching the Registration Window Running Installation Routines Entering Accounting System Integration Key Entering Payment Gateway Connector Key(s) Checking Requirements Before installing CREDIT CARD ADVANTAGE make sure the system meets the minimum requireme nts: Operating System must be Windows 2000, Windows XP or Windows NT. The latest service pack of Dynamics / Enterprise must be installed. Workstation must have constant live connection to the Internet in order to process credit card transactions. The workstation must meet the minimum hardware requirements of the Dynamics / eenterprise system. Running the CCA*.exe To run the CCA*.exe administrative privileges are required on the environment. 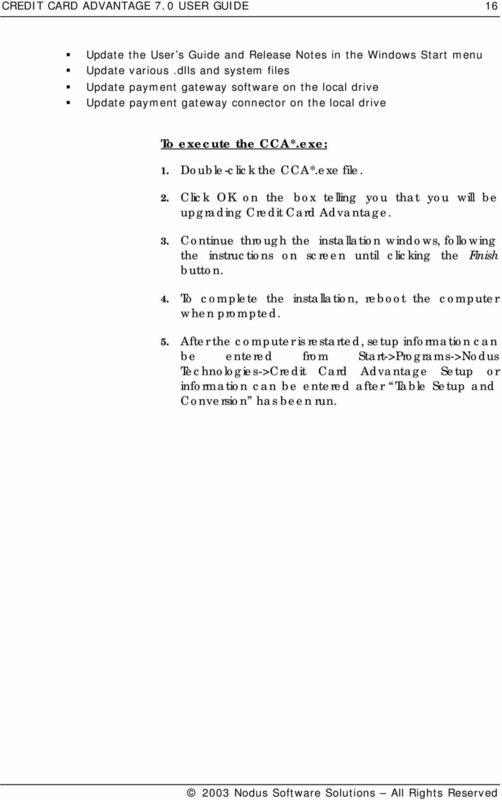 The install routines include the will do the following: Copy the cca*.cnk file to the Dynamics / eenterprise launch directory Install the User Guide and Release Notes to the Windows Start menu Install various.dlls and system files Install payment gateway software on the local drive Install payment gateway connector on the local drive To execute the CCA*.exe: 1. Double-click the CCA*.exe file. 2. Follow the instructions on-screen. 12 CREDIT CARD ADVANTAGE 7.0 USER GUIDE When asked where Dynamics / eenterprise is installed, change the default location to match the Launch directory of Great Plains. 4. Continue through the installation windows, following the instructions on screen until clicking the Finish button. 5. To complete the installation, reboot the computer when prompted. 6. After the computer is restarted, setup information can be entered from Start->Programs->Nodus Technologies->Credit Card Advantage Setup or information can be entered after Table Setup and Conversion has been run. 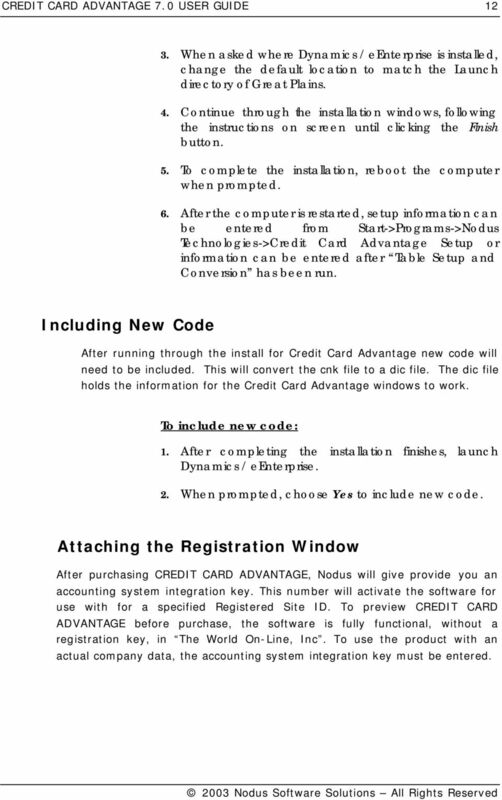 Including New Code After running through the install for Credit Card Advantage new code will need to be included. This will convert the cnk file to a dic file. The dic file holds the information for the Credit Card Advantage windows to work. To include new code: 1. After completing the installation finishes, launch Dynamics / eenterprise. 2. When prompted, choose Yes to include new code. 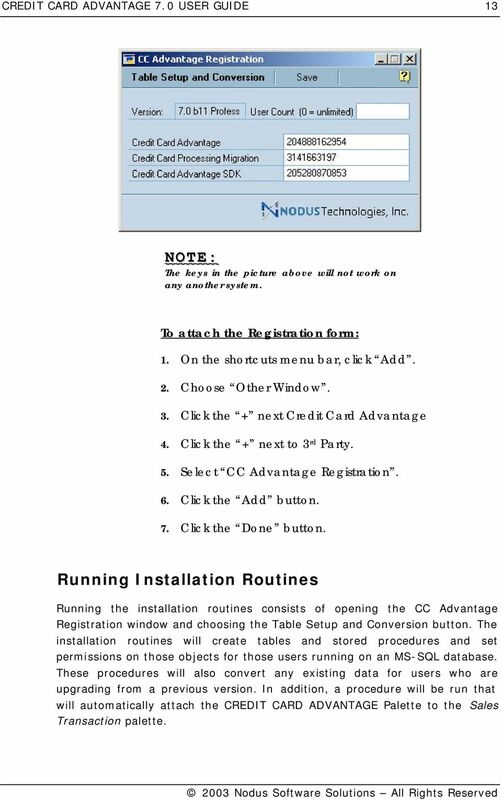 Attaching the Registration Window After purchasing CREDIT CARD ADVANTAGE, Nodus will give provide you an accounting system integration key. 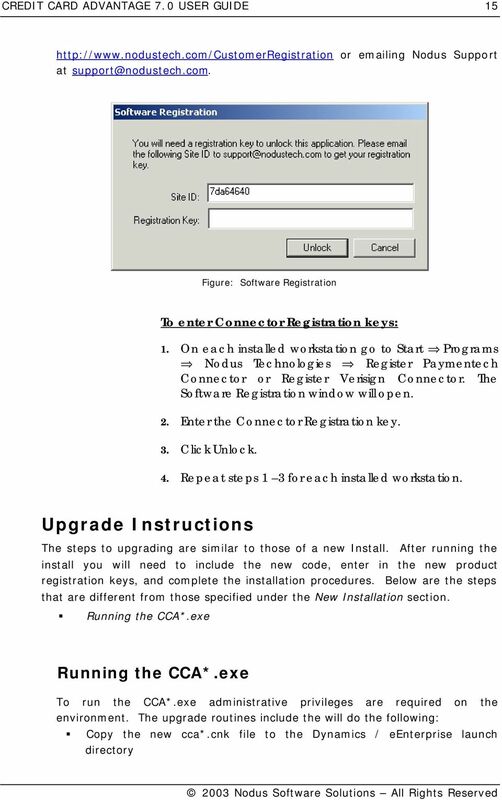 This number will activate the software for use with for a specified Registered Site ID. To preview CREDIT CARD ADVANTAGE before purchase, the software is fully functional, without a registration key, in The World On-Line, Inc. To use the product with an actual company data, the accounting system integration key must be entered. 13 CREDIT CARD ADVANTAGE 7.0 USER GUIDE 13 NOTE: The keys in the picture above will not work on any another system. To attach the Registration form: 1. On the shortcuts menu bar, click Add. 2. Choose Other Window. 3. Click the + next Credit Card Advantage 4. Click the + next to 3 rd Party. 5. Select CC Advantage Registration. 6. Click the Add button. 7. Click the Done button. Running Installation Routines Running the installation routines consists of opening the CC Advantage Registration window and choosing the Table Setup and Conversion button. The installation routines will create tables and stored procedures and set permissions on those objects for those users running on an MS-SQL database. These procedures will also convert any existing data for users who are upgrading from a previous version. In addition, a procedure will be run that will automatically attach the CREDIT CARD ADVANTAGE Palette to the Sales Transaction palette. 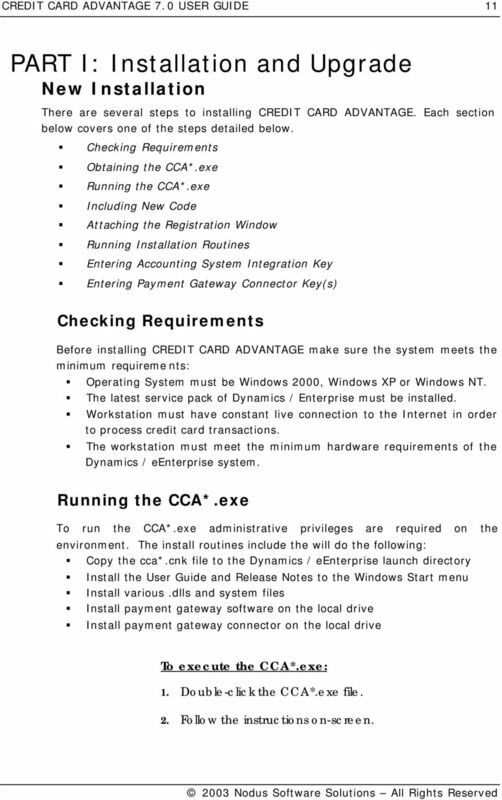 16 CREDIT CARD ADVANTAGE 7.0 USER GUIDE 16 Update the User s Guide and Release Notes in the Windows Start menu Update various.dlls and system files Update payment gateway software on the local drive Update payment gateway connector on the local drive To execute the CCA*.exe: 1. Double-click the CCA*.exe file. 2. Click OK on the box telling you that you will be upgrading Credit Card Advantage. 3. Continue through the installation windows, following the instructions on screen until clicking the Finish button. 4. To complete the installation, reboot the computer when prompted. 5. After the computer is restarted, setup information can be entered from Start->Programs->Nodus Technologies->Credit Card Advantage Setup or information can be entered after Table Setup and Conversion has been run. 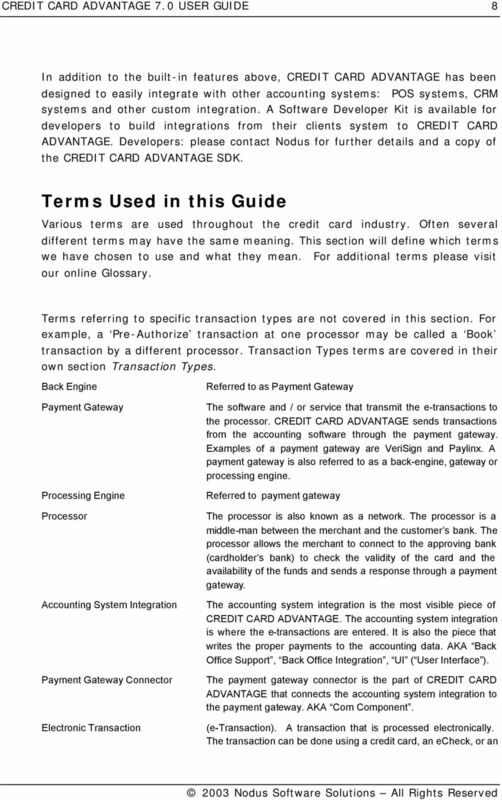 17 CREDIT CARD ADVANTAGE 7.0 USER GUIDE 17 PART II: General etransaction Information Transaction Types This section explains each of the transaction types in CREDIT CARD ADVANTAGE. The steps for processing each of the transaction types are nearly identical. Slight variations are identified and explained in this section Please note: the various names of the transaction types vary by processor. A Sale may be called Capture by some processors. A Book may be a Pre-Authorize. There are other variations. The names chosen for CREDIT CARD ADVANTAGE are among the more common but are not universal. Though the names may vary, the processing details do not. Sale An approved Sale is an immediate charge to the customer s credit card or account; however, the charge will not show up until after settlement. If a Sale is saved to a batch, the charge will not occur until the batch is sent for approval. A Sale can only be reversed with a Void or a Credit. A Sale transaction does the same thing regardless of it being a credit card transaction, an echeck transaction, or an ACH transaction. Book When dealing with credit card transactions a Book is a reserve of a specified amount on the customer s credit card or account. A Book prevents the customer from using that portion of their credit / funds, but does not actually charge the card nor transfer any moneys. A Book is useful for companies that ship merchandise one or more days after receiving an order. By issuing a Book, a company reserves the necessary amount on the customer s card at the time of the order. This reserve assures an approved Ship transaction at the time the merchandise is eventually shipped. 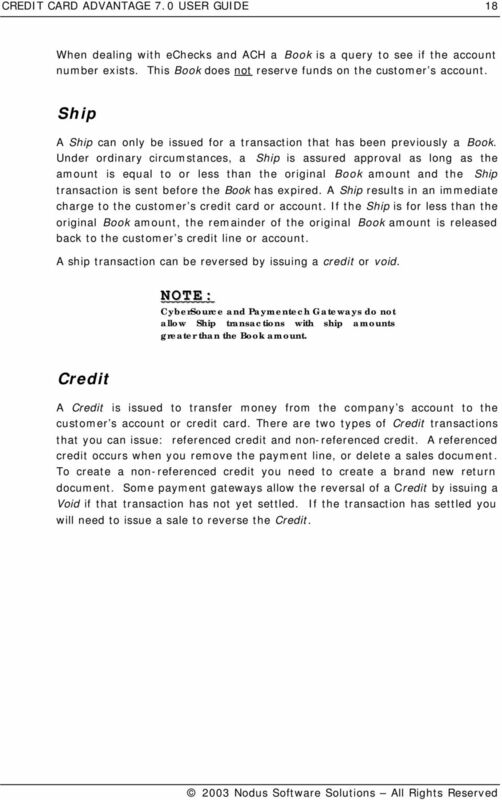 A Ship transaction is necessary to complete the Book. 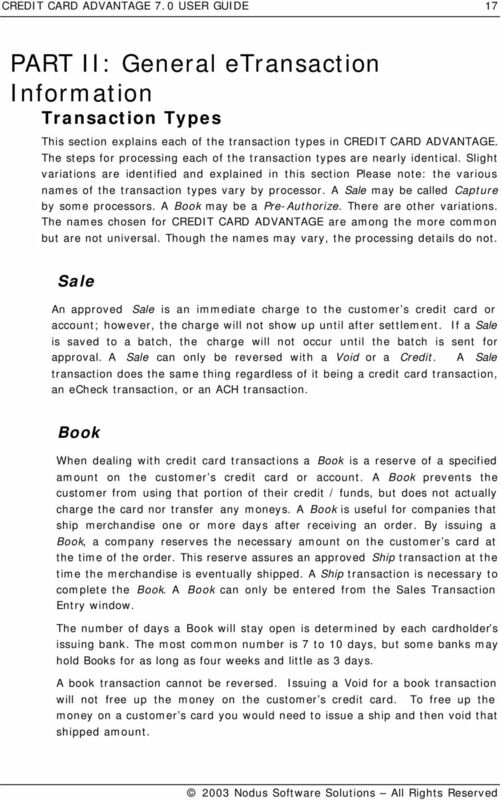 A Book can only be entered from the Sales Transaction Entry window. The number of days a Book will stay open is determined by each cardholder s issuing bank. The most common number is 7 to 10 days, but some banks may hold Books for as long as four weeks and little as 3 days. A book transaction cannot be reversed. Issuing a Void for a book transaction will not free up the money on the customer s credit card. To free up the money on a customer s card you would need to issue a ship and then void that shipped amount. 18 CREDIT CARD ADVANTAGE 7.0 USER GUIDE 18 When dealing with echecks and ACH a Book is a query to see if the account number exists. This Book does not reserve funds on the customer s account. Ship A Ship can only be issued for a transaction that has been previously a Book. Under ordinary circumstances, a Ship is assured approval as long as the amount is equal to or less than the original Book amount and the Ship transaction is sent before the Book has expired. A Ship results in an immediate charge to the customer s credit card or account. If the Ship is for less than the original Book amount, the remainder of the original Book amount is released back to the customer s credit line or account. A ship transaction can be reversed by issuing a credit or void. NOTE: CyberSource and Paymentech Gateways do not allow Ship transactions with ship amounts greater than the Book amount. Credit A Credit is issued to transfer money from the company s account to the customer s account or credit card. There are two types of Credit transactions that you can issue: referenced credit and non-referenced credit. A referenced credit occurs when you remove the payment line, or delete a sales document. To create a non-referenced credit you need to create a brand new return document. Some payment gateways allow the reversal of a Credit by issuing a Void if that transaction has not yet settled. If the transaction has settled you will need to issue a sale to reverse the Credit. 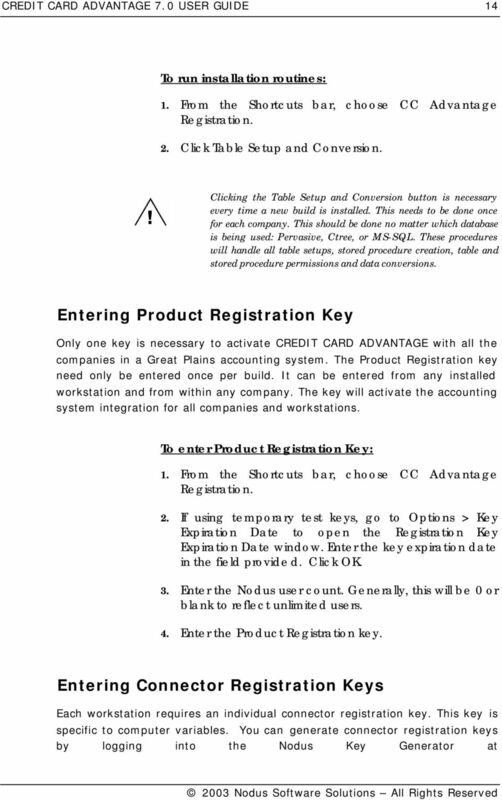 19 CREDIT CARD ADVANTAGE 7.0 USER GUIDE 19 Figure: etransaction Entry set to process a Credit transaction. Force A Force is used to enter already approved transactions. A Force is typically used for capturing a phone authorization. When entering a Force you will be required to enter the authorization code. Be sure the Dyn/eEnt Only option is unselected to perform this type of a Force. A force can be reversed by issuing a credit or a void. 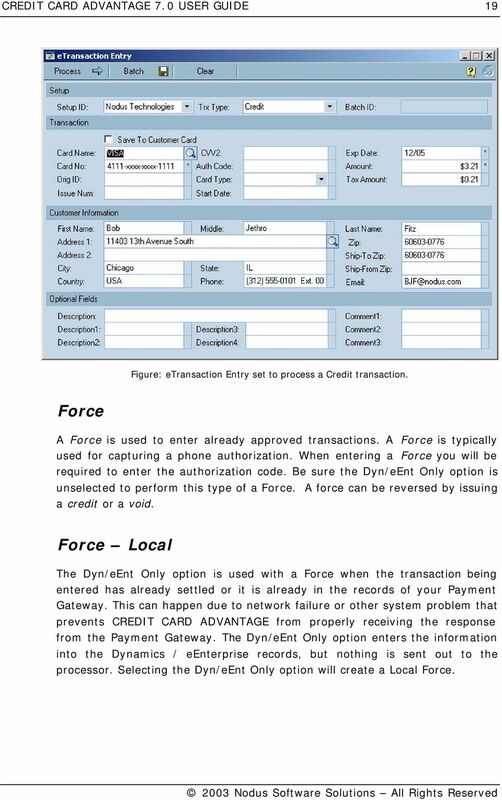 Force Local The Dyn/eEnt Only option is used with a Force when the transaction being entered has already settled or it is already in the records of your Payment Gateway. This can happen due to network failure or other system problem that prevents CREDIT CARD ADVANTAGE from properly receiving the response from the Payment Gateway. The Dyn/eEnt Only option enters the information into the Dynamics / eenterprise records, but nothing is sent out to the processor. Selecting the Dyn/eEnt Only option will create a Local Force. 20 CREDIT CARD ADVANTAGE 7.0 USER GUIDE 20 Void A Void is issued for an unsettled approved transaction. 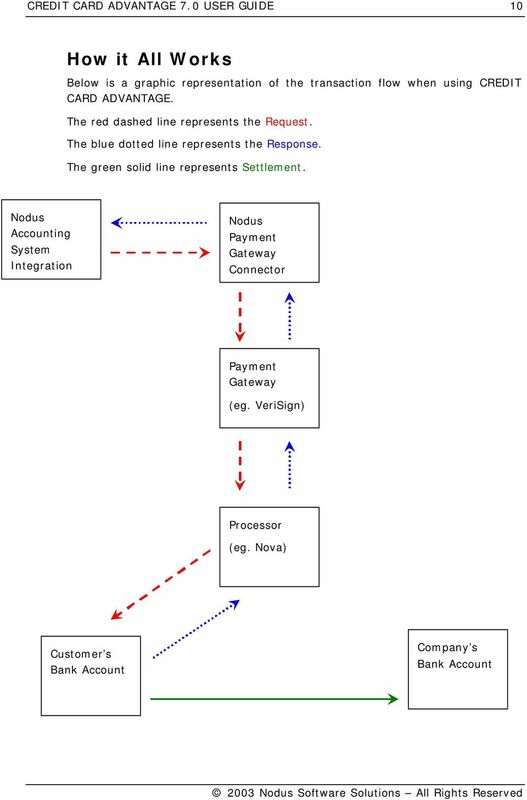 When a Void is successfully issued, neither the Void nor the original transaction will appear on the customer s statement. A Void can only be issued against an unsettled transaction. When a Void is sent, if the original transaction has already been settled, the Void will be denied and a warning will be displayed. A settled Sale transaction must be reversed with a Credit. Settlement Settlement is the procedure that transfers money from one account to the other. A sale, force, credit and ship are the only transaction types that are settled. Credit Card Advantage does not run settlement at the same time as your payment gateway. This means that all of your transactions that reach your payment gateway will be settled. 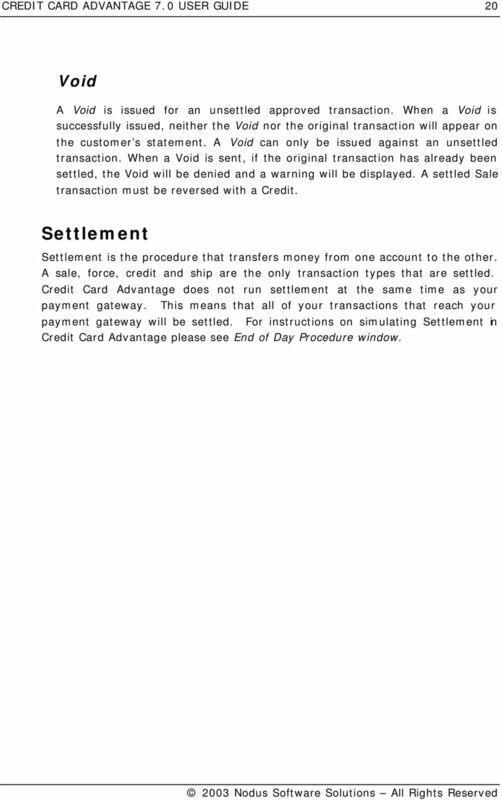 For instructions on simulating Settlement in Credit Card Advantage please see End of Day Procedure window. 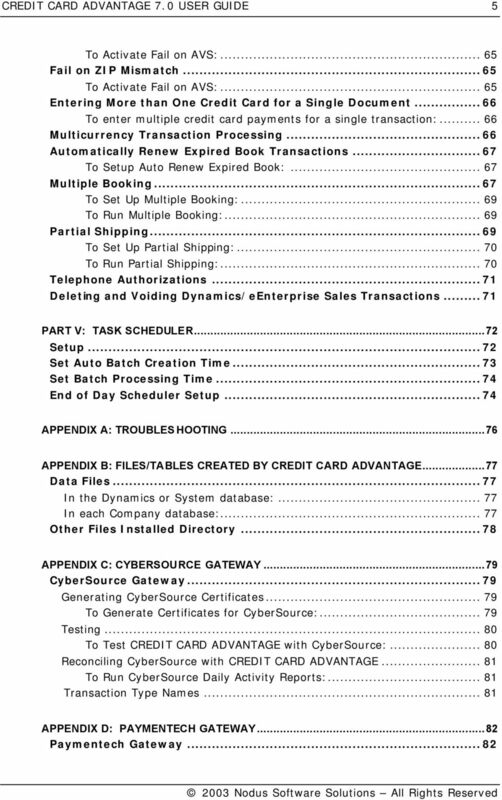 22 CREDIT CARD ADVANTAGE 7.0 USER GUIDE 22 Field Name Required / Optional Description / Use General Setup ID Required A unique identifier for to distinguish different setup options. Connector Required The name of the payment gateway to be used by a specific setup id. Processor Required The name of the processor to be used by a specific setup id. Payment Type Required Choose the type of card to be used by a specific setup id. Payment Types include ACH, Debit, Credit, and Electronic Check. Processing Server Name or IP Required This is the address information for the server to which the CC transaction will be sent. 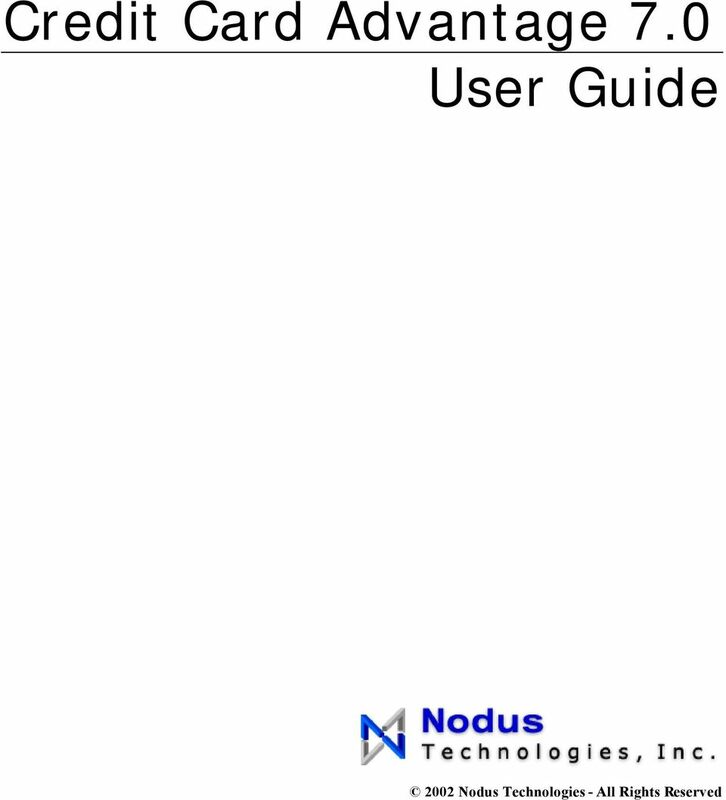 23 CREDIT CARD ADVANTAGE 7.0 USER GUIDE 23 Field Name Required / Optional Description / Use More information is located in the About Your Payment Gateway section. Port Required This is the connection information for the server to which the CC transaction will be sent. This information can be found in the About Your Payment Gateway section. Authentication User ID Required for VeriSign The Merchant Login to your VeriSign Payflow Pro/Link account. BIN Required for Paymentech Bank Identification Number. Merchant ID Required for CyberSource and Paymentech Set by CyberSource or Paymentech gateways. Partner ID Required for VeriSign If the VeriSign account was setup by Nodus Technologies then it is nodus. If the VeriSign account was setup by another vendor then contact that vendor to obtain the required information. Password Optional for CyberSource Required for VeriSign Set by CyberSource or VeriSign gateways. Terminal ID Required for Paymentech Used for the Paymentech Gateway. Great Plains Associated Checkbook Optional The Checkbook ID of the account where payments received with this ID will be deposited. Denied Batch Name Optional When batched CC transactions are processed, any denied transactions are moved to a separate batch. This field accepts the name of the batch that will hold denied batch transactions. Auto Settlement Time Optional This is the time when Credit Card Advantage, if Great Plains is open, will move everything from the open table to the history table. This move indicates that settlement has taken place. Through Connection Manager Generic Setup ID Credit Card Advantage Setup ID s can also be created or modified using the Connection Manager: from the Start -> Programs -> Nodus Technologies - > Transact Advantage Setup. Both windows will display the same generic setup information regardless of where they have been entered or modified. However, Advanced Options can only be set in Great Plains. 25 CREDIT CARD ADVANTAGE 7.0 USER GUIDE 25 like different transaction setup information then you will need to create an Advanced Setup ID. Below are the additional fields that are part of the Advanced Setup ID. Field Name Required / Optional Description / Use Proxy Server Setup Proxy Name or IP Port User ID Password Optional Merchant Options Enter the necessary information to access the internet through the network. Merchant Service # Merchant Descriptor Required if using VeriSign gateway and Paymentech processor. Required if using VeriSign gateway and Paymentech The service number of the Paymentech Processor. 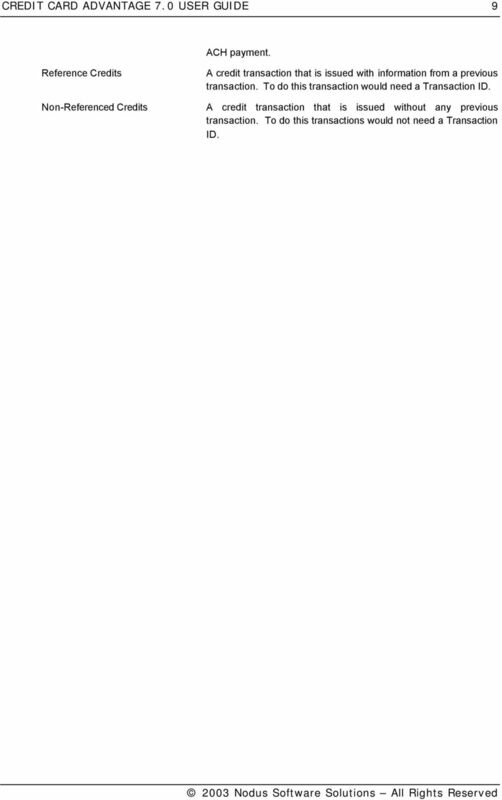 The descriptor number for the processor. 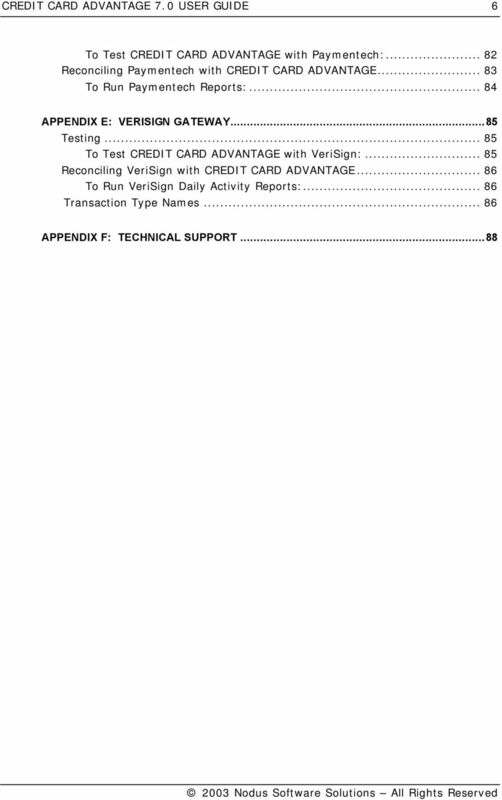 27 CREDIT CARD ADVANTAGE 7.0 USER GUIDE 27 Field Name Required / Optional Description / Use activated. This feature allows for part of book on the order / backorder to be transferred to an invoice and part to an order / backorder. The Multiple Book feature overwrites this feature. If both are marked you will be given those privileges of Multiple Book. Recurring Billing Optional If marked the transactions from Recurring Billing module will be transferred into Batch Verification window when Batch Verification window is opened. This feature should be marked only when Recurring Billing module is integrated with Dynamics/eEnterprise. Company Default Setup Window Each company setup for CREDIT CARD ADVANTAGE may have multiple Setup IDs. Each Setup ID can specify different processors, different merchant accounts and / or different transaction classes. The Company Default Setup ID allows a default setup ID for all users who are accessing specified company. Leaving the User Can Select Other Setup IDs box unmarked will restrict users to only the Setup ID chosen on the Company Default Setup ID window. In order to ma ke changes to this window you will need to be logged in as sa. To create a Default Company Setup: 1. Login to Great Plains as sa. 2. Open the Credit Card Advantage Setup window: Transactions Sales CC Advantage Setup. 3. Open the Company Default Setup ID window: CC Advantage Setup Company Default Setup. 4. Use the look-up to select a Setup ID. 28 CREDIT CARD ADVANTAGE 7.0 USER GUIDE To restrict users to only the chosen Setup Id, leave the User Can Select Other Setup IDs box unmarked. The User Default CC Advantage Setup window can be used to allow specific users and user classes to override the company default Setup ID. User CC Advantage Security Setup Window The CC Advantage User Security Setup window allows the System Administrator (sa) to setup Security for Credit Card Advantage. The System Administrator can set a default Setup ID for any and all Users. Also, the System Administrator can setup up what types of transactions the user can process. The user will be able to create all types of transactions; however, the user will not be able to send these transactions to the payment gateway for verification. To setup a User Security for CREDIT CARD ADVANTAGE: 1. Login as sa. 2. Open the Credit Card Advantage Setup window: Transactions Sales CC Advantage Setup. 3. Open the User CC Advantage Security Setup window: CC Advantage Setup User Security Setup. 29 CREDIT CARD ADVANTAGE 7.0 USER GUIDE Select the User or Class radio button. 5. Use the look-up to select a Setup ID. 6. To restrict users to only the chosen Setup ID, leave the User Can Select Other Setup IDs box unmarked. The User Default CC Advantage Setup window can be used to allow specific users and user classes to override the default Setup ID. 7. Uncheck any checkboxes to limit the type of transactions a User can process. 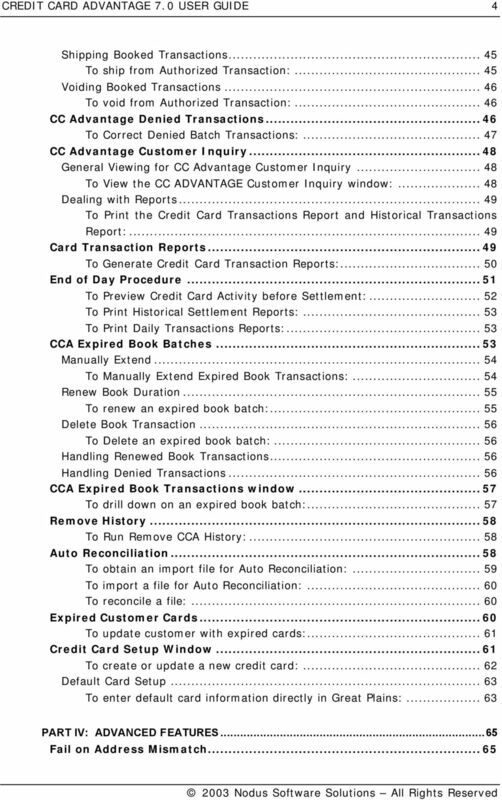 CC Advantage Book Duration Window Book transactions reserve a specified amount of money on a customer s credit card. Because the dollar amount is already reserved against the customer credit card, an approval is virtually guaranteed when a follow-up ship transaction is sent to the processor. The number of days a book is kept open is determined by each cardholder s issuing bank. The most common is 7 to 10 days, but books may be held for as long as four weeks. The number entered here is the number of days CREDIT CARD ADVANTAGE will consider the book open. This may not exactly coincide with the number of days an individual book stays open. Each credit card may be associated with a book duration. To setup the book duration enter the number of days the book will remain open and an expired batch name. Leaving the number of days as 0 will turn off the expiration for book transactions by selected cards. After book transactions expire, they will be placed into batches under the Expired Book Batch Name. 30 CREDIT CARD ADVANTAGE 7.0 USER GUIDE 30 NOTE: To get the correct number of days a credit card authorization remains open contact the credit card company. CC Advantage Book Duration window only lists those credit cards associated with the Checkbook ID in CCA Setup window. To setup a Book Duration for a credit card: 1. Open the Credit Card Advantage Setup window: Transactions Sales CC Advantage Setup. 2. Open the CC Advantage Book Duration window: CC Advantage Setup Book Duration Setup. 3. Use the look-up button to select a credit card name. 4. Enter in the number of days to keep a book transaction open. 5. Enter a prefix for the expired book batch name or leave it as the default. Shortcut Keys Setup Instead of using the standard shortcuts that Credit Card Advantage uses, user s can set up their own shortcut keys. These keys are used to open the etransaction Entry window in a different format. 31 CREDIT CARD ADVANTAGE 7.0 USER GUIDE 31 NOTE: Do not use a shortcut value for one that is already in Great Plains. To setup Shortcut Keys: 1. Open the Credit Card Advantage Setup window: Transactions Sales CC Advantage Setup. 2. Open the Shortcut Keys Setup window: CC Advantage Setup Shortcut Keys Setup. 3. Enter in the keys that you want to use to as shortcuts. 4. Click Save to save changes. etransaction Entry Window The etransaction Entry window is where you will enter in the customer s information. You then have the ability to process the electronic transaction or save it to a batch. This section will go over the steps in creating and processing transactions in Credit Card Advantage. Opening the etransaction Entry Window There are two ways of opening the etransaction Entry window. The following table lists the different ways of opening the etransaction Entry window. The following table lists the various hot keys shortcuts built in to CREDIT CARD ADVANTAGE, the windows from which they are available and their function. Window How To Open Function Sales Transaction Entry Receivables Transaction Entry Cash Receipts Entry Invoicing Entry Sales Transaction Entry Control S From the Main Menu Bar click Extras -> Sales or Credit Transaction Control B From the Main Menu Bar click Extras -> Book Transaction Opens etransaction Entry window for a Sale or Credit transaction. You can change the Trx Type to process other types of transactions. Opens etransaction Entry window for a Book transaction. You can change the Trx Type to process other types of transactions. 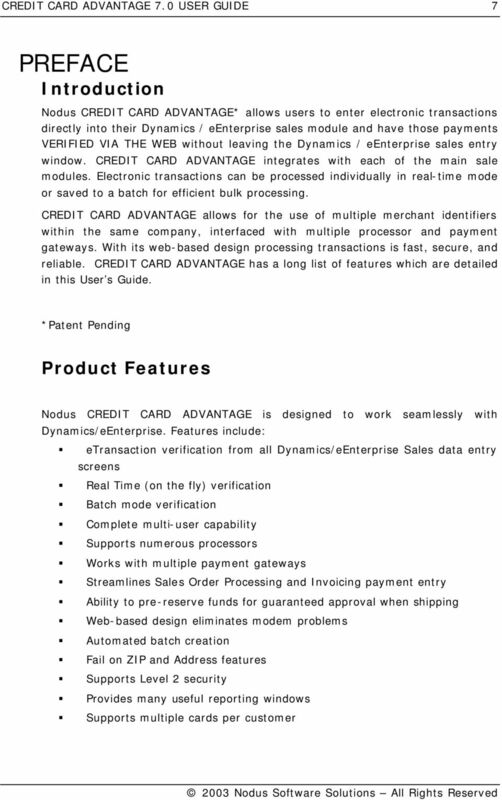 35 CREDIT CARD ADVANTAGE 7.0 USER GUIDE 35 Field Name Required / Optional / Read Only Description / Use discount rate. Address2 Optional The second line of the billing address for the card. Based on the agreement with your credit card processor, the inclusion of this information may result in a lower discount rate. City Optional The city of the billing address for the card. Country Optional The Country of the billing address for the card. Optional Card holder s . First Name Required The card holder s first name from the card being used. Last Name Required The card holder s last name from the card being used. Middle Name Optional The cardholder s middle name from the card being used. Phone Optional Cardholder s phone number on file with the credit card issuer. Ship-From Zip Required depending processor on Default from main sales document. Can be changed. Ship-To Zip Required depending processor on Default from main sales document. Can be changed. State Optional The state of the billing address for the card. Zip Optional The zip of the billing address for the card. Based on the agreement with your credit card processor, the inclusion of this information may result in a lower discount rate. Optional Fields Description Optional Sending extra information for transactions. Description 1 4 Optional Sending extra information for transactions. Comments 1 3 Optional Sending extra information for transactions. Processing Electronic Transactions You can process transactions real time or in batch. When processing real time you submit a request to the gateway upon hitting the process or the ship button. When processing in batch mode you save the transactions and then submit them all at once. For more information on Batch processing refer to Batch Verification Window. 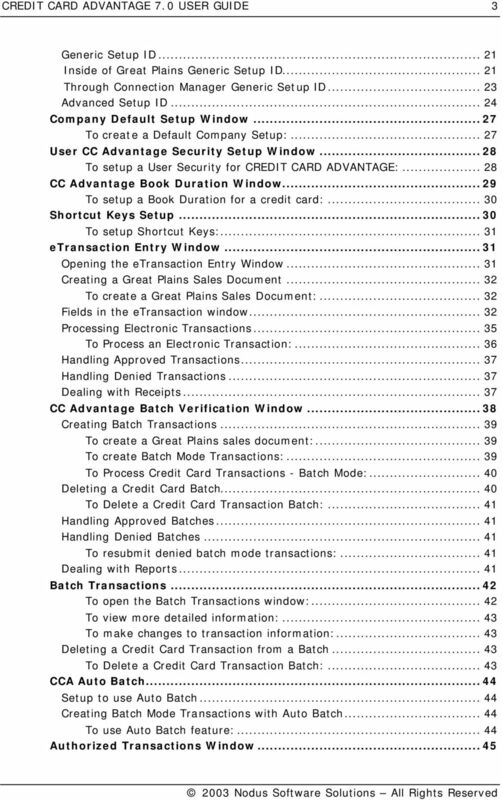 36 CREDIT CARD ADVANTAGE 7.0 USER GUIDE 36 After creating the Great Plains Sales document you will be ready to process the electronic transaction. The procedure for processing electronic transactions is similar for all transaction types and payment methods. The real difference is the fields that need to be filled out. The required fields for the transaction type and payment method will have a star, *, next to them. The following steps for processing a transaction assumes that the Great Plains sales document has been created and the etransaction Entry window is already open. To Process an Electronic Transaction: 1. Under the Setup Section select the Setup ID that you want to use to process with. For information on the Setup ID refer to the Setup ID Window section. 2. Select the transaction type from the drop down list that you wish to perform. Note: Certain documents can only process certain types of transactions. 3. Enter in the transaction information. The Transaction table in the previous section lists all of the fields, whether they are required or not. For testing refer to the appendix for your gateway. The difference between a credit card transaction and an echeck/ach transaction is the information being sent to the processor. 4. Enter in or update any and all of the customer s billing information. 5. Enter in any comments or descriptions 6. For real time processing click on the Process button. To process in batch mode click on the Batch button. To ship a transaction refer to Authorized Transaction. 38 CREDIT CARD ADVANTAGE 7.0 USER GUIDE 38 Advantage Customer Inquiry and bring up the transaction. Doubling clicking on the transaction will bring up the etransaction window. From the window click on the printer icon in the upper right corner and select the destination to print to. You can also open the etransaction window by going to Receivables Transaction Entry and/or Cash Receipt window. Then use one of the methods to open the etransaction Entry window detailed earlier in this section. CC Advantage Batch Verification Window Alternatively to Real Time processing, unprocessed credit card transactions may be saved in a batch. When credit card transactions are saved in a batch, all transactions in the batch are sent for verification at once. No verification is done at the time the transactions were entered. When using batch mode, all credit card transactions in the batch must be approved before the batch can be posted. Once the batch is sent for approval, denied transactions are removed from the batch and placed into their own separate denied batch. (See CREDIT CARD ADVANTAGE Setup for information about the name of the denied transaction batch.) Moving the denied transactions allows the rest of the batch to post. 39 CREDIT CARD ADVANTAGE 7.0 USER GUIDE 39 NOTE: You cannot post Dynamics/eEnterprise Sales documents that are associated with credit card transactions until the credit card transaction have been approved or removed. You cannot post Sales batches that include credit card transactions until the batch has been processed from the CC ADVANTAGE Batch Verification window. Creating Batch Transactions In order to perform batch mode processing you will need to create batch transactions. The steps to create a batch mode transaction are similar to those of creating a real time transaction. First you create a Great Plains sales document and then you create the CREDIT CARD ADVANTAGE batch transaction. To create a Great Plains sales document: 1. Open the Great Plains Sales document. 2. Enter in your customer s information. 3. Enter in a Batch ID. 4. If using a Receivables document then enter in the amount. If using an Invoice Entry or a Sales Transaction Entry document enter in the line items. 5. From the receivables document, you can open the etransaction Entry window by tabbing out of the Amount field. From Sales Order Processing and Invoice Entry you will need to open the etransaction Entry window yourself. For steps on opening the etransaction Entry window refer to the etranaction Entry Window section. To create Batch Mode Transactions: 1. After opening the etransaction entry window enter the credit card information. For more information on the fields see the tables in the etransaction Entry window.